Fill out our simple form and get quotes from local jugglers. Clown about and hire a juggler to entertain guests at your party. 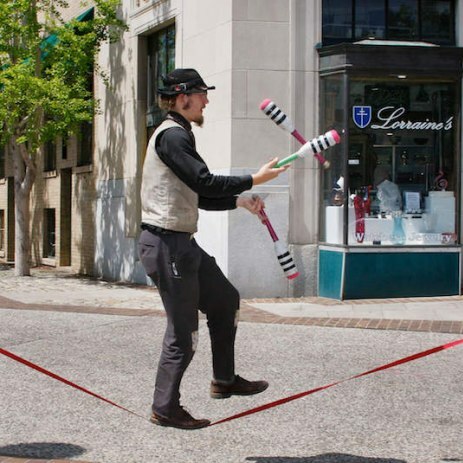 Whether or not you’re throwing a circus themed event, having jugglers mingling with guests, performing tricks and perhaps even letting others have a go, is a great touch for a fun event. Watch our jugglers showcase their juggling skills and interact with your guests. If you're feeling brave, you may be able to participate in the tricks. Juggling is usually part of a set of acts that party entertainers can provide for a wedding, children’s party or any kind or family fun day. As with any circus act there’s a skill to juggling, and watching a professional perform is always impressive. Some jugglers will offer workshops or simply let guests have a go as they pass by. Hiring a juggler for your event is simple, just browse entertainers here and select who you would like to receive a quote from. Planning your party or event can all be done in one place here at Add to Event, so if entertainment is on your list, give a juggler a go!